The scene: late in the afternoon at the directorate of health and family welfare services in Bangalore. Officials, who claimed that no chikungunya case had been registered since August 22, had organised a trip to Bidadi primary health centre (PHC) in Ramanagara taluka in Bangalore rural district. I had no expectations, though I did meet 58-year-old Nagaraja who was already recuperating and could even take care of his utensil shop. Just as we were about to leave, an auto rickshaw entered the compound. A woman was helped off and she painfully hobbled her way towards the clinic. The 50-metre distance took around five minutes to traverse with her husband supporting her. When 38-year-old Nagamma finally made her way to the examination bed, her husband told me she had developed chikungunya symptoms two hours ago. They had travelled 16 km from their village, Kollandanahalli, in neighbouring Kanakapura taluka . Neither was in a state to answer questions. She had a long wait ahead the only doctor in the clinic was attending to another patient. and map Even though chikungunya is not fatal, its debilitating character deprives people of their livelihoods. The disease incapacitates people for anything between 15 days to three months because one of its main symptoms, excruciating joint pains, persists well after the fever caused by the disease subsides. In Karnataka, the disease came at a time when the land was being readied for the planting season -- work was easy to find. Word had gone around and people were running scared. The 30 per cent increase in the sales of mosquito nets in the Hariyana Handloom Centre in Kanakapura taluka was testimony to this. 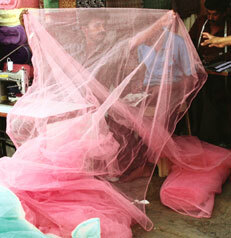 And the fears were well-founded, chikungunya did cause ravages and losses of livelihoods. Throughout Karnataka, the evidence of how the disease impacts livelihoods was overwhelming. Yet, there has been no effort to document this. "Labour was difficult to find during the peak epidemic period," says Hanumantha Reddy of Navodaya Education and Environment Development Services, an ngo based in Ranebennur, Haveri district. His work on a water project was delayed due to labour shortage. 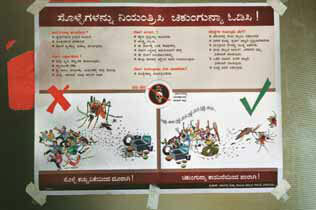 M S Patil, a sub-inspector in Ranebennur, gave another example. In the past two months, out of the 46 people working in his department, 12 had contracted chikungunya. Three were out for a month, three were off for 15 days and the others got a week off. They were lucky. Those without regular jobs didn't have the luxury of paid leave and suffered, even in Haveri district, where jobs were aplenty because it is a trading hub and a major seed production centre, with more than 70 companies, including Monsanto, being based there. Loss of wages is the most important, but not the only economic fallout of chikungunya. Madiwalappa Angadi of Garag village in Dharwar district got the disease in the second week of June -- his wife was already suffering. He had just finished planting cotton and, as was normal, started his day tending to his crop. But he was uneasy the whole day and by night he became feverish and his joints started paining. His family of seven depends on the approximately 3.5 hectares (ha) he owns. He could afford to rest only for five days because unless he took immediate steps, the incessant rains would destroy the whole crop. But he had a tough time for it was difficult to sit and even more difficult to get up. Weeds took over the field -- they were in fact taller than the stunted cotton plants. Angadi finally had to hire labour, which was in short supply in the village -- fortunately, villagers helped out by releasing their workers on a rotational basis. But he had to shell out Rs 50 a day per worker. To meet the cost, he sold his grain reserves and did not have to borrow. In Gangapur, Haveri, Sridhar Gowda's sister Ratna caught the virus, he had to hire labour to ensure that the work lost was made up. Family members had till then been capable of managing the workload. Working tired Ratna, even though it was a month since she had fallen ill and she could only manage light household work. The family had just under 3.5 ha of irrigated land, which fetched them at least Rs 4,000 per crop, but the family was big and needed more. People in Mummigatti village in Dharwar blamed the disease for the complete loss of crop this year. Basavgowda Patil said that if people had been healthy, they could have taken steps to remove the excess water from torrential rains and weeded their fields regularly. This would have saved at least part of the crop. The rains destroyed 29-year-old Ravi Pujar's rice crop. 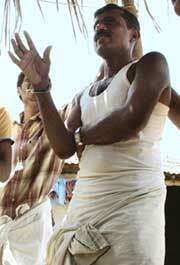 An inhabitant of Kotur village, in the same district, he would have earned something around Rs 40,000 from it. He feels if he had not fallen sick at the time, he would have made a profit of at least Rs 20,000. He still cannot work and is waiting to clean up the field and plant a new crop -- which will take at least two months. He has taken a loan of Rs 4,000 since he fell sick in July. Though running the house just needs Rs 1,500, money also had to be borrowed for the Ganpati festival. In Gudagur village in Ranebennur taluka, 40-year-old Shantamma Asundi was preparing to sleep, tired with housework. She first had fever and joint pains two months ago and still has relapses. In the family of five, she is the only woman and has to continue providing for the family even though the doctor says she should rest. "My sons would feel that I was acting because I did not want to provide food to them so I started working," she says. The disease seems to have the worst effect on women, who can't afford to rest. Doctors say, this could be the reason for repeated relapses. In Kotur village, Kallava Garagad prefers not to go to defecate in the fields in the morning to avoid the walk and the squat. Doctors say that this is a trend with most patients. Some decide not to eat or drink to avoid tricky movements. Other than the obvious weakness and accumulation of toxins in the body, this also leads to accumulation of fluids in the body and worsens the swelling on the joints. People in villages that don't have phcs are the worst off. Patients have to travel long distances to go to a doctor or buy medicines. Seventy-year-old Kalamma of Kachuvanahalli village in Bangalore rural district spends Rs 12 as bus fare every time she visits the doctor; she has made seven such visits. Moreover, she can get to the bus stop only if she gets a lift from passing vehicles. On each trip she gets Rs 50 worth of medicines and two injections for Rs 35 each. Three members in her family have suffered and they have spent a total of Rs 7,000 on treatment. Kalamma sold her earrings to meet the cost. In the absence of adequate state health care, private doctors in Ranebennur taluka have thrived. Proper doctors treat only the better off. Otherwise, local registered medical practitioners (rmps), who work on credit, provide treatment. In late 2005, an unidentified disease was noticed with rapidly increasing regularity in the southern and western parts of the country. It appeared to be severely debilitating, inducing high fever and excruciating pain in the joints, which would persist much after the fever subsided. The first batch of cases was reported in the country in October that year. But it was only in December that samples in Maharashtra tested positive for the chikungunya virus, a relatively unknown quantity outside research circles, especially because it had surfaced on a major scale 33 years ago. Almost a year on, the disease has been detected in Karnataka, Andhra Pradesh, Tamil Nadu, Kerala, Maharashtra, Gujarat and Madhya Pradesh (see table State of the disease). There are reports that it has surfaced in Goa, Delhi and Rajasthan as well. As of August 22, 2006, over 1.1 million people were suspected of having contracted the disease.This figure is obscured in some ambiguity -- it could be an underestimate or an overestimate. On the one hand, only those coming to government centres are enumerated, on the other, fever cases are being labelled chikungunya across the board in affected areas. On July 30, the health ministers of the four worst-affected states -- Karnataka, Andhra Pradesh, Tamil Nadu and Maharashtra -- held a meeting to draw up measures to tackle the problem. The minister from Karnataka took the initiative. The memorandum they submitted to the Union ministry of health and family welfare mentioned that poor people were suffering because they were not able to earn a living. Unfortunately, the states did not have much information to substantiate their claims. The Union minister, Anbumani Ramadoss, did not appear impressed, asking people to stop panicking since the disease was not fatal. This might not be completely true for there have been reports of older people and people with existing health problems succumbing to the disease. The authorities are just not taking note. And now they are saying that the disease is under control. This is despite the fact that the system of data collection is flawed -- addresses are noted down only if samples are drawn. A door-to-door survey is carried out in areas from which patients have come and the number of people affected is identified. Samples are not being collected because the National Institute of Virology (niv) is overburdened and there is no account of new areas being affected or even whether the disease is under control or not. "We have sent 91 samples to niv. They requested us not to send any more as the burden was too much," says S D Awaradi, district health and family welfare officer, Dharwar. Moreover, the kind of records that are maintained does not make it possible to establish conclusively whether individuals fell prey to chikungunya. Dharwar district, with 60 per cent of the population affected by the disease, is a good case study of the impact of the disease and the measures taken by the government to control the epidemic. 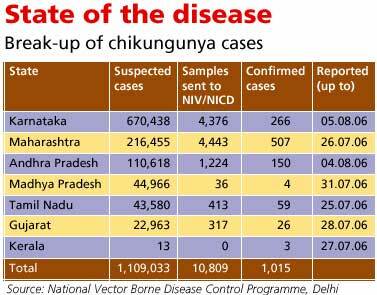 Chikungunya had been confirmed as long back as on May 19, 2006, but Karnataka chief minister H D Kumaraswamy met district officials only on July 5 to ensure that adequate control measures were being put in place. M S Srikar, the district magistrate of Dharwar, says the administration is adopting a two-pronged approach to control the epidemic -- treatment and prevention. The authorities say the disease started declining by July 15. According to figures released by the Dharwar district authorities, they have so far procured medicines worth Rs 5.72 lakh. The list of medicines does not include an antacid, necessary when huge amounts of painkillers like diclofenac are administered. "Maximum focus is on the painkiller diclofenac sodium (on which almost Rs 3 lakh has been spent). This could be the industry's way of making up the losses since the veterinary use of the drug has been banned," says Gopal Dabade, Drug Action Forum, Karnataka. The use of this painkiller has created other health problems for people who end up using it for months. In Ranebennur taluka, where huge amounts of the drug have been administered, Nagaraj S Doddamani, surgeon at the government hospital, admits that a few patients with holes in stomach walls have been coming to the hospital. They need to be operated upon. There are other irregularities. For instance, cases of doctors in government hospitals charging for medicines in rural Bangalore. Doctors say the reason for this is that people demand medicines that are not supplied by the government. To cater to the patients' needs, doctors buy medicines and charge for them. There are also cases of hospitals providing better treatment to influential people. When Yashwant K Sahukar of Maidur village in Ranebennur fell sick, he was given preferential treatment because he knew the doctor. This was the same hospital where the poor could not even get a place to sit during the peak epidemic time. In villages, malpractice is rampant. rmps prescribe antibiotics and vitamins indiscriminately to treat this disease. In Kotur village, 40-year-old Kallava Garagad fell sick in August. As per government guidelines, she should be prescribed the mildest of painkillers and an antipyretic. Strangely, the doctor gave antibiotics and vitamins along with paracetamol. He also gave her two injections. For this he charged Rs 100, money borrowed from a neighbour. Luckily, he did not put her on intravenous fluids, a practice being followed by a lot of other doctors. This would have meant more money for the doctor but would have led to more swelling in her joints. A similar case could be seen in the Gudagur village in Ranebennur taluka. Thirty-two-year-old Devaka was sick for two months and fell prey to quackery. For a total expenditure of Rs 2,000, she has been treated with diuretics, painkillers, antibiotics and vitamins. She has been sick for so long that even the people in her village have started giving her medicines they found useful in their treatment. The government put up special camps in villages. But these camps were few in number and there was no effort to upgrade existing treatment facilities. Though there is a phc in Garag, Dharwar district, for instance, Angadi had to get treatment from a private doctor because he could go to the doctor only in the evening. The phc does not have the doctor all the time -- he attends the clinic two to three times a week but can be called in case of emergency. For the three Angadis who fell sick, the family had to spend around Rs 2,000. There are some initiatives, however. Dharwar district has carried out a small trial for homoeopathic treatment. District officials approached a private practitioner, Mohan Kumar from Hubli, on July 10, 2006, to get this experiment rolling. A total of 220 people suffering from chikungunya in three villages were treated. Around 30 per cent of the people got better within one hour of being medicated. The results have been communicated to the state authorities. The second approach has been to create awareness about the disease and take precautionary measures. The Dharwar health department has bought six new fogging machines and these, along with the four existing ones, have been deployed in rural areas. Five mobile teams had also been created to monitor the incidence in the five talukas of the district. A total of 40 litres of pyrethrum has been sprayed so far. The responsibility of fogging lies with the village panchayats. This may not have helped much, as senior officials in the health department accept that the fogging is not done inside houses where mosquitoes are likely to be. In fact, the officials went on to say that fogging was only a placebo effect and was not effective in controlling the disease. Nevertheless, the Centre is buying 400 fogging machines for four states. State authorities say this is not enough. Observers say that the chemical industry lobby is pressuring the government to buy fogging machines. The problem is the simpler solutions are not pursued. Karnataka, for example, does not have a public health law to ensure that people do not allow stagnant clear water pools, in which the Aedes aegypti mosquito breeds, says Ravi Narayan, advisor, Community Health Cell, Bangalore. The state health machinery is not equipped to handle the burden of creating awareness. In rural Bangalore, of the sanctioned 670 posts of field workers, 180 are vacant. In Kanakapura taluka, of the 72 posts of female health workers, only 28 are occupied, and of the 43 posts for male workers, only 18 posts have been filled. Even these people do not have the time to go to villages to create awareness or collect data because they have to be in the hospitals to deal with the increased work load caused by the disease, says K P Paramesha, Kanakapura health officer. The responsibility of controlling this kind of vector-borne disease lies with the directorate of National Vector Borne Disease Control Programme (nvbdcp) in Delhi. The directorate reveals that logistics and technical guidelines have been provided to the different states. States have been authorised to incur expenditure on information, education and communities out of the funds made available by the Centre under nvbdcp. Temephos, for killing larvae in water, and pyrethrum, for fogging, have been provided to four states. Teams from the National Institute of Communicable Diseases (nicd) and nvbdcp have made field visits to review the situation and provide technical guidance and logistic support to states. At the interstate meeting in July, the state health ministers claimed that all possible steps have been taken to contain the disease. These include active surveillance by the health workers and early detection of cases, supply of drugs, establishment of fever treatment depots with the assistance of anganwadi workers, ngos and teachers, vector control by cleaning all water storage units once a week, fogging and putting larvicides in open water sources, and community sensitisation. The health ministers decided to implement a joint action plan to prevent and control chikungunya. For this they wanted central assistance for control of the vector (insecticides and fogging machines), diagnosis of the virus, treatment and research. The four states demanded around Rs 92 crore. Basavaraju, Karnataka commissioner, health and family welfare services, says Rs 13.77 crore has been spent in his state on chikungunya control. The responses of the states and Centre are expected. There are the usual tall claims and jockeying for funds. What is absent is a coordinated approach and efforts to prioritise the areas -- research and control -- on which the focus should be. Chikungunya was first reported in 1952 when it caused an epidemic on the Makonde plateau in Tanzania. The disease was called chikungunya, which, in Makonde meant that which bends up, to describe the stooped posture caused by the arthritic symptoms of the disease. Since then, the disease has been reported from the Seychelles, Mauritius, Madagascar, the Comoros Islands, Malaysia, Cambodia, Vietnam, Myanmar, Sri Lanka, India, Pakistan, Indonesia and the Philippines. In Asia, the virus was first isolated in Bangkok in 1958. In India, chikungunya was detected for the first time in Kolkata in 1963. There were extensive outbreaks during 1964-1965 in south and central India. Maharashtra reported cases in 1973. 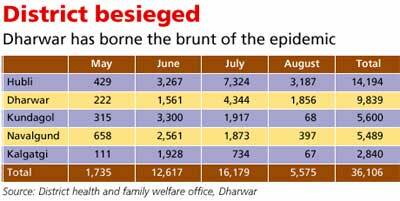 The virus virtually disappeared for 33 years before resurfacing, again in Maharashtra, in 2005. Though chikungunya has been around for over half a century, worldwide, little research has gone into it.who and the Indian Medical Association typify the attitude towards the disease both say it is not dangerous on the basis of sketchy evidence. Since the virus was first described, PubMed, a database of medical journals, shows just 547 entries on chikungunya. Compared to this, 744 reports have been put out on avian influenza during the last year. India mirrors this state of ignorance and neglect. An nvbdcp report, for instance, said there was an epidemic resurgence of the disease in 2001-2003, but no one took note of it. The ongoing outbreak has finally shaken the establishment, but is not enough to pull out the stops to track and study it. The government is relying largely on information from the Runion Islands, which is also going through an epidemic that has claimed over 200 lives. Only one sample is collected per 100 cases. Only two laboratories, those of niv and nicd, are carrying out the tests for the disease; between them they don't have the capacity to process the number of samples they receive. A total of 11,836 samples have been sent, but the labs have not been able to furnish results after months. In these circumstances, decent epidemiological studies are not possible. Even so, there are some clues about the resurgence of the disease and its rapid spread. The Aedes aegypti mosquito, the main carrier, can only fly very short distances. This makes houses ideal breeding sites, giving it access to humans. Being a day-biter, it has a disturbed feeding pattern. The result is that the mosquito bites lots of people and, therefore, spreads viruses more widely. The mosquito feeds every second day and can transmit through its life cycle. A number of studies generated by niv have thrown some light on chikungunya. nvbdcp unfortunately has not made much use of the findings. A 2004 study showed that high temperatures alter the susceptibility of adult Aedes aegypti mosquitoes to the chikungunya virus. So an increase in temperature above the normal average in an area leads to an increase in the proportion of mosquitoes that can carry the virus. In 2003, the institute reported that a parasite, Ascogregarina culicis, in the mosquito could have an important role in the maintenance of virus during inter-epidemic periods. The same year, they found that the Anopheles stephensi, found mostly in urban areas, could also transmit the virus. (In Runion, another species of mosquito, the Aedes albopictus, has also been found to be a carrier. Aedes albopictus is active outdoors, while Aedes aegypti typically feeds and rests indoors.In 2002, niv also published the results of a serological survey in the human population of the Andaman and Nicobar Islands, which showed the presence of the virus. The same year, it developed a rapid and simple test that could detect the virus in the carrier, which was a significant step forward for surveillance purposes. It can be completed in two days as compared to the 10 days taken by conventional techniques. The institute also found that during an outbreak of a dengue-like illness in eastern India, Aedes aegypti mosquitoes tested positive for the chikungunya virus. Evidence of dual dengue-chikungunya infection was also detected then. It has also become clear that chikungunya spreads very easily, as the eggs can remain dormant for over a year. The lifespan of the mosquito is around 30 days and the virus takes around seven days to multiply in the mosquito. Since the mosquito passes on the virus through its eggs, prevention of breeding is the only way of controlling the disease. One reason why the disease is spreading so quickly could be that people do not have immunity to the virus because it has not been around for a long time, says V Ravi, head, department of neurovirology, National Institute of Mental Health and Neuro Sciences, Bangalore. A serosurvey conducted at Kolkata around a decade ago showed that only 4.37 per cent of samples tested were positive for chikungunya antibodies, with the highest rates observed in the age group of 51-55 years and no chikungunya antibodies detected among the young and young adults. Given that the first group would have experienced earlier chikungunya outbreaks, the study lends credence to the view that infected people get lifelong immunity. But the latest outbreak seems to undermine this theory, given that many people are reported to have multiple relapses. Studies on the mosquito, which spreads other diseases, have also shown that it started breeding in rural areas only after government water, supply reached these places. The logic of this development was that when governments started supplying water people were forced to store it for long periods. This gave the Aedes aegypti its ideal breeding habitat -- clean, stagnant water. In affected states, the government is asking people to empty all water containers and clean them regularly. But this is an impractical solution, given the reality of water scarcity and erratic supply. Research has shown that water storage tanks contribute 90 per cent of breeding sites for the Aedes aegypti. Chemicals can be put in storage reservoirs to kill the larvae. But this is not a good method because it would require officials to treat every tank in affected areas -- a stupendous task. Moreover, people do not like chemicals in water. Making mosquito-proof tanks is the only way out, but there is no advocacy in this direction, say vector control specialists. Another problem is that mosquito control is now under the purview of panchayats but steps have not be taken to train people to identify the correct chemicals to buy and carry out the programme in a scientific manner. But the issues of research and testing must be seen from the right perspective. Former nicd director K K Datta points out that monitoring and surveillance should take precedence and research bodies like niv should be actively involved in this endeavour to control the spread of the disease. niv could, however, argue with justice that it had carried out a study in Andhra Pradesh in December 2005 and warned the government that an epidemic could occur, but it was ignored. Surveillance is also necessary to identify mutations that could make the virus more deadly. niv officials say the virus that has caused the epidemic this time seems to be different from the one that had caused earlier outbreaks. Studies are being planned to confirm this. Analysis of the outbreak in Runion has suggested that the increased severity of the disease may be due to a change in the virus's genetic sequence, which potentially allows it to multiply more easily in mosquito cells. In July 2006, a team in the island analysed the virus's rna and determined the genetic changes that have occurred in various strains of the virus and identified the genetic sequences that led to the increased virulence of recent strains. The lack of surveillance is mirrored in the myopic responses of the government in the matter of treatment protocols. The government says there is no specific treatment for the disease and has prescribed paracetamol and painkillers. The Runion epidemic revealed, however, that chloroquin could be effective against the virus and there could be other more suitable drugs. Some districts in Karnataka use a certain amount of chloroquin. In the mid-1980s, the us Army Medical Research Institute of Infectious Diseases developed a vaccine. Though it was effective in trials, it is yet to be commercially made. The point, however, is not whether drug A or B will be more effective. The question of medication is connected to surveillance and research. If the health establishment does not know what variant of the virus is causing the disease, it cannot possibly know what drug to administer, other than by accident. Relying on the Runion experience is not the best solution, since the island strain could be different. But questions of treatment and research are overshadowed by the issue of prevention. The government just has not put into place the systems that will ensure that conditions are created in which mosquitoes are not allowed to breed. Vector management will take care of not just chikungunya, but a host of other diseases.